Fortunately there are now some excellent online accountancy software packages that can eliminate much of the administrative burden. Although paying for a subscription based service when most people already own a program such as Excel may not sound like a money saving strategy, there are tangible benefits to doing so. Online accountancy software will automatically compile all the numbers, providing the correct total figures, all but eliminating mistakes. No more setting up and double checking formulas, or editing them when a new category or expense type is required. Should the regulations change, for example the rate of VAT, then this will also be updated automatically. Short of sending copies of completed spread sheets to an accountant every week or paying for a book keeper, there is no easy way in which to get feedback or advice throughout the financial year. Using online accounting software will ensure that your accountants are able to view figures in real time. This allows them to give advice on issues such as tax and pricing in a far more timely fashion, rather than once a year when it is too late. Invariably everyone will design their spread sheets differently and sometimes what makes sense to one person can mean extra work for their accountant. The software has been designed with accountants in mind. This will reduce extra fees associated with the many hours they spend making sense of the figures provided for them. Alternatively, there is always the option of finding IT contractor accountants, who specialise in working exclusively with sole traders. Trawling through a year's badly organised finances can be tiresome and a more common occurrence than most accountants would like. Not only does the consistency provided by online accounting software benefit your business, but most accountants will thank you for it. 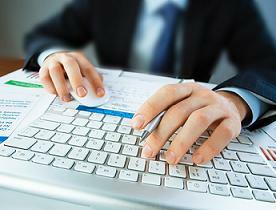 Most accounting software has other useful features that traditional spread sheets lack. Invoices can be set up automatically, in addition to estimates and reports for the time spent on projects. This eliminates the need to separately prepare this information in different programs. Lending an added element of professionalism to any business, this reduces cost in both the time and money spent on paperwork. Finally it is worth remembering that accounts set up using online software can be accessed anywhere with an internet connection. This can provide business owners and senior managers with up-to-date accounts at the press of a button, for example on a smartphone whilst travelling between jobs. So in conclusion, online accounting software can save time, money, reduce errors and provide up-to-the-minute accounts at the press of the button.